When did you last eat? If it’s been longer then 2–4 hours, it’s time to eat! When you wait too long between meals, you’re more likely to overeat. This is key for me. I need to eat every 3 hours otherwise my blood sugar drops and the irritability kicks in. If I leave it too long, I make bad choices and my son’s treat bag starts to look really tempting. If I don’t have much time, I will always make a smoothie to eat then, or save in the fridge for when I need it. This is great for a mid-afternoon or mid-morning slump! Where is the complete protein? Does your meal or snack include protein? If not, find a healthy source, such as a 3–4 oz. portion of lean meat or fish, a combination of grain and legumes, a full or half serving of protein powder, or even a few tablespoons of hemp seeds– which contain approximately 10 grams of protein per 2 tablespoons. Where are the veggies (preferably green ones)? 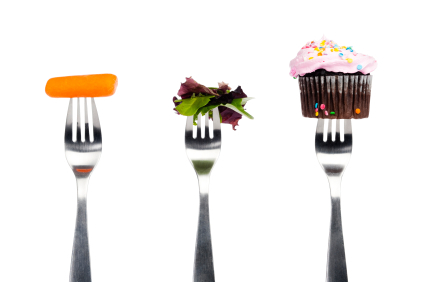 Does your meal or snack include at least a cup of raw or a half a cup of cooked vegetables? Have them steamed or stir fried preferably, but make sure you have at least five servings per day. An easy way to bump up your green veggie intake is to add them to your smoothies. Raw veggies & hummus makes a great snack or prepare a yummy salad for lunch. Get your healthy fats from mono-unsaturated sources, such as olive oil, olives, avocado, and even chia or flaxseeds. You need to have a modest amount of fat throughout your day. Healthy fats are essential for your health and also help to keep you feeling satisfied. There are a number of different sports drinks on the market. More and more, kids are drinking them, along with soda & juice, as part of their regular fluid intake, even when they are not active. Sports drinks are marketed to rehydrate and replace electrolytes that have been lost during exercise. Don’t get me wrong, electrolytes are very important as they are necessary for proper muscle contraction and to generate energy in the body. However, these types of drinks provide few nutrients and contain high amounts of refined sugars, artificial colours, and flavours. 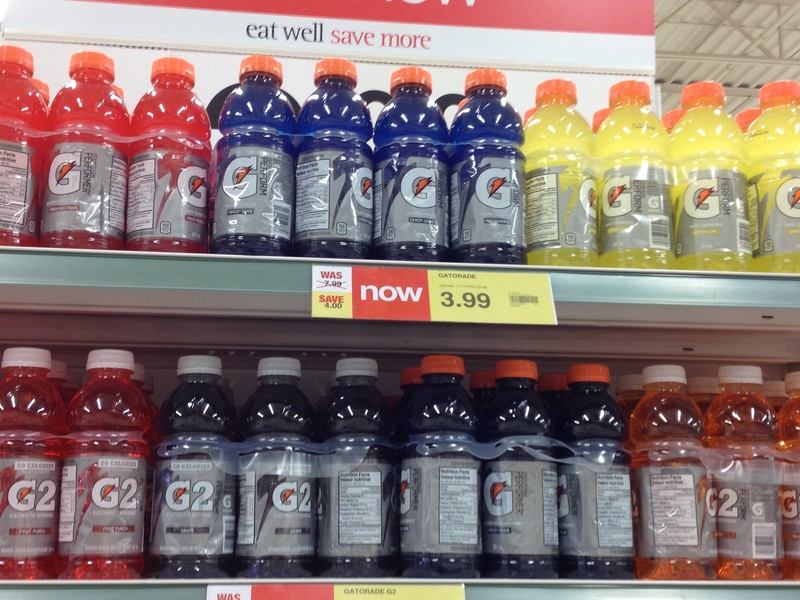 Gatorade is the most well-known company on the market. They are owned by Pepsi-Cola and hold approximately 75% of the market share in the sports drink category. They are also endorsed by a number of different athletes that kids look up to. On their website, Gatorade displays all 30 athletes they sponsor, including Sidney Crosby, Usain Bolt, & Michael Jordan. Gatorade has a number of different products on the market but their G-perform contains 30 grams of sugar and their Thirst Quencher a whopping 42 grams, that’s 10½ teaspoons of sugar in just one 710 ml bottle, that’s more sugar than in a can of Coke! My 5 year old son plays soccer & softball during the summer, but because his energy output isn’t what I would call strenuous, I know he doesn’t need a sports drink after his games. I actually think he breaks more of a sweat at the local indoor playground! So when do kids need to replace their electrolytes? Well, they are only needed if they have engaged in a solid period of hard & strenuous activity and are sweating a lot. If after exercising, your child suffers from muscle cramping, light-headedness, trouble concentrating, or heart palpitations, this could be a sign that they need electrolytes. However, before reaching for the Gatorade, check out the following healthier food & drink options. Coconut water is a clear, sweet liquid with a nutty taste, it is found inside young, green coconuts. It is a great source of electrolytes and will keep the body well hydrated. There are a number of different brands on the market today – 2 of my favourites are Vita Coco & Zico. When choosing coconut water choose the unflavoured versions as they will have less sugar. This is made with maple sweet water as the base ingredient (this is the liquid that comes directly from the maple tree). It provides vitamins, minerals, and electrolytes and the flavoured versions are sweetened with maple syrup, which is a natural sweetener. If you like the idea of Gatorade and think you will have a tough time convincing your child to stop drinking it, here is a recipe I have taken from, ‘Whole Foods to Thrive’ by Brendan Brazier, to make your own sports drink. Blend all ingredients together. Strain out the pulp using a mesh sieve, cheesecloth or nut milk bag if preferred. Serve cold. If you like this blog, please share with your family & friends and if you have any questions about this or any other nutritional issues, please contact me using Facebook or email or leaving a comment using the icon to the right of this article. Summer is one of my favourite times of the year – not just because there’s no white stuff on the ground and it doesn’t takes me half an hour to get the kids dressed before leaving the house ­­­– but because there are so many local, delicious fruits & vegetables available this time of year. This is my second year growing my own garden and I have to say there is nothing better than eating something that you have grown in your own backyard! I definitely do not have green fingers but even I managed to grow a small selection of vegetables last year, so if I can do it – you can, give it a try next year! 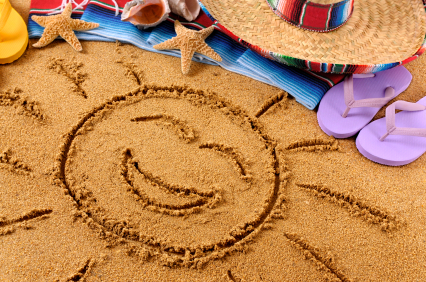 I wanted to share with you my top 5 summer foods for weight loss. Eating these will help keep your weight in check and leave you feeling 100% satisfied and if you can, buy them from local farmers as this will reduce your ecological footprint and help make the earth a happy place. There are an abundance of local cucumbers to be found in the summer. Cucumbers are low in calories (only 14 calories per cup) and high in nutrients, so are very filling. They also have a high water content and a natural cleansing effect on your body. Use cucumbers to make a summer cooler: in a large pitcher of water add a whole lemon, thinly sliced, a whole cucumber, thinly sliced, and some fresh mint leaves. Cool for a minimum of 1 hour in the fridge before serving. Sprouts are high in fibre & protein and low in calories, so they can help you feel full while keeping your blood sugar under control and curbing those cravings! My favourites are sunflower and pea sprouts. I add them to salads, sandwiches, and even throw a handful in my smoothies! If you know me, you will know that I am always raving about leafy greens, my favourites being spinach & kale. They are high in fibre and nutrients, especially magnesium, B-vitamins. I make a green juice & smoothie every day which includes between 4-5 servings of leafy greens alone. Try adding a handful of romaine or spinach to your smoothie today! It’s not just an old wives tale! 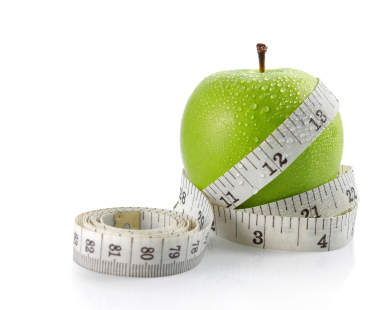 Research shows that eating an apple a day can keep the doctor away and benefit weight loss. This is because apples are low on the Glycemic Index and do not cause those nasty blood sugar highs and crashes. They are also low in calories (one medium apple contains 81 calories) and high in fibre and other nutrients which help give you energy. For a healthy breakfast or snack add diced apple to plain greek yogurt, chopped walnuts & some raw honey (if needed). Watermelon is the perfect food for weight loss, it is nutritious, it tastes great, and it is low in calories. One cup of watermelon contains only 49 calories! Like cucumbers, watermelons have a high water content so they are refreshing as well as satisfying. For a frozen treat, puree some watermelon and freeze it in ice cube trays. Once frozen, put in a blender and pulse until it has a slushy-like consistency. You could also blend some watermelon with fresh mint leaves and enjoy a watermelon mocktail! I hope you enjoy incorporating the above foods into your diets this summer and feeling good about eating them. Take control and plan meals & snacks ahead of time if you can. Setting aside just 1 hour a week to plan will help ensure that you have healthy meals prepared and that the fridge (or cooler) is stocked with lots of healthy meals & snacks to avoid temptation. Regardless of whether you are at home or travelling, you want to be eating a balance of lean protein, fruits & vegetables, and whole grains. Make homemade burgers instead of store bought ones, have turkey, chicken, or veggie dogs, instead of the high fat hot dogs. If you are eating out, try and research places before hand – have a look online at their menus and try to pick a restaurant that has some healthy options. Be careful of the portion size, these often tend to be bigger than you need and remember, you can always take a doggie bag home for lunch the next day! Drink more water! Water retention can add extra weight and can be a sign you are dehydrated and your body is holding on to water for fear of becoming further dehydrated. It is also a sign that you may have too much sodium in your body and drinking more water will help flush this out. On average, we need about 2 litres of water each day to stay hydrated. Plus, if you are drinking alcohol, remember one glass of water for every alcoholic drink! To calculate the amount of water you should be drinking, divide your body weight (lbs) by 2 and this will give you the number (in ounces) of water you should be drinking each day. I don’t want you to feel deprived when you are on vacation or at home during the summer but this is a time when people often over indulge. Try to limit yourself to 1 treat a day (this includes those campfire S’mores!). Put the first 3 ingredients in the blender and blend until smooth. Taste and if sweet enough, don’t add the honey (extra calories). If adding the honey pulse for 10 seconds to thoroughly mix, then pour into 6 popsicle molds, place into the freezer for 3 hours or until frozen solid. Now there is just one last tip i want to add to help you survive the summer holidays and that is to sit back, relax and enjoy every second.